Thread: Thoughts on the British dub? Re: Thoughts on the British dub? I think it was very unnecessary. Was there an actual reason for it being made?? I agree it was unnecessary. original voices were the best! I'm not sure if dubbing British accents over American ones was the right thing to do. Not sure if it was wrong either. Call me biased, but I grew up with this dub, and I prefer it. On first hearing American Ziggy, I felt he sounded weird. I've noticed that in Extra Ziggy has the catchphrase "Brilliant!" I did a bit of searching and apparently a lot of US shows got UK dubs back in the day (probably even now, but I can't be bothered to search any more) because they didn't want British kids still learning how to speak to develop mixed accents or something. If you listen closely enough it sounds like Bessie's singing it... but I'm sure we all know why that is! Yes, they dubbed it so the children wouldn't develop any mixed accents. I mean, if an American said elevator, a British person would say lift. The main problem with the so called "British " dub, is that all the voices are southern English, there are no Scottish, Welsh or Irish accents, new even any English regional accents. However if you want to hear some really strange British accents, look for some old episodes of "The Pot Men", on youtube. The dub would certainly be better if the voices changed from the original didn't all have the same voice actor. 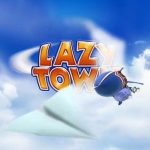 The closest this wasn't the case was in LazyTown Extra, only Ziggy had a british voice and everyone else have their original actor's voice.